The elderly are among the most vulnerable in any community and as the average age of the population increases, there are more of them, a figure that’s only going to grow over the next few decades. Many are active and fiercely independent, but inevitably there will be a percentage, and a growing percentage at that, that will have mobility problems.How can a community help its elderly? The simple principle of good neighbourliness is always the best idea. In most cases, you know when your neighbours are around. You hear noises through the wall (or the floor or ceiling if you’re in a flat), or you see them in the garden. If you have an elderly neighbour and hear nothing for a day, nip round or call them on the phone, just to be sure they’re fine.Some may debate it, but we have a duty to the older members of our communities. We can help them, and we should. Community organizations, in particular, are excellent vehicles for that. But even as someone living close, you can help older neighbours. When you’re going shopping, ask if there’s anything they need, for instance. Community organizations work best when interfacing with official bodies – arranging transport to community centres, or, if necessary, transport to doctor’s appointments or to the hospital. With a pool of volunteers to draw on, they can also arrange drivers on short notice if there’s no free transport in your area. They can also contact social services if necessary, and help the elderly with various forms, or obtaining pensions and so on. But perhaps the greatest thing you can do for your older neighbours is simply to befriend them. Pop in for a cup of tea and a gossip when you have the time. 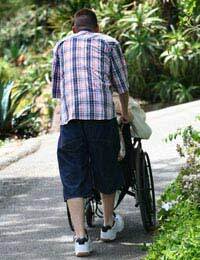 Many older people live alone, or some care for a husband or wife, but all too often they have little outside company. For an hour a week you can be a breath of fresh air to them and enliven their day. It seems like a small thing, but it can make a big difference. All these are short-term solutions, part of the everyday fabric of life. But they’re just some of the things a community can do. If there’s not already one in your area, starting a Seniors Group at the community centre is an excellent. Not only does it get the elderly out of their four walls, it brings them together with others their own age for a little while each week. For those who can get out but perhaps have difficulty walking, raising funds for a mobility scooter can give them a huge amount of freedom. If you look in the right places, you can pick up scooters quite cheaply these days, and maybe arrange with a local tradesman to service them free of charge, which is another help to the elderly. Your organisation can also talk to local restaurants and see if they might be willing to offer reduced price meals to people over 65. It can be an incentive for them, since they’ll end up with more customers – even if they just do it on nights during the week that are slow. It makes the elderly feel worthwhile and respected, that their custom is valued. Put together, all of these things, and other initiatives you come up with, can make the lives of the elderly in your community much more pleasant. I amvery much interested to start a community organization which will be assisting the elderly in terms of food, healthy and housing. I am a Malawian citizen by national. Elderly people in Malawi are the worst hit by poverty,they cannot afford high to purchase farm inputs and medical bills hence the idea of establishing a community organization to look for welfare of such people. However I need assistancein areas of implementation and funding.The organization will be run with transparency and accountability. Your ideas and any form of assistance are welcome. Chrsitian Greetings to you from India.I am brother and Evangelist & Pastor,U.Yesu ratnam is writing to you sir, I want you help and assistance in Elderly people here in India who are in Christian fellowship need your help and please send me your letter and more details to follow you good services here to India also and thanking you sir, and I wil be waiting for your kind replies and thanking you sir, and team members in. Yours Faithfully in Christ Jesus bro.U.Yesuratnam,pue,Evangleist. arun Lankavaripet, Narsapuram;AP; West G.Dist;India. pincode;534275,code.